I enjoyed free time for one year (2005). I went to Japan and took Geisha class and traveled around. Then BofA rehired me on Nov. 2005. Everything was new to me. I had to learn Teradata SQL, SAS, UNIX shell scripting, Excel (include VBA macro, Pivot table, functions), Word, e-Commerce tables infrastructures and UNIX (IBM-AIX operating system). Also, I wasn’t familiar with On-Line Banking, Bill-Pay, and Credit Card systems. I handled production jobs, new development, maintenance, ad-hoc reporting, numerous research/analysis for system conversions (it was tough, because we started to consolidate legacy BofA’s SF and LA systems (had 2 separate data centers), NationsBank, and FleetBoston Financial, Seafirst Bank (acquired by legacy BofA in 1983, BankAmerica continued to operate its subsidiary as Seafirst rather than B of A until the 1998 merger with NationsBank. BofA Oregon (former Rainier Bank) Oregon’s finance officers were very kind to me. I was Private-Eye to find “Subject Matter Expert” in the world of BofA. So my new system’s database fields have a clear definition by all acquired banks. ) then in the middle we encountered to handle credit card giant MBNA. It was very fast-paced work environment. I had to work 24/7. The “Type a question for help” on upper-right corner on Microsoft office application was my life-line. I learned everything from those and from Internet tutorials for programming languages and operating systems. I spent every night, every weekend to explorer various database tables so that tables joining, filtering, and selection criteria are correct. Besides doing jobs, there were web-meetings, tele-conferences with team or business partners or external vendors all day. Countless of training such a Six Sigma (it means a measure of quality that strives for near perfection. Six Sigma is a disciplined, data-driven approach and methodology for eliminating defects (driving toward six standard deviations between the mean and the nearest specification limit) in any process. Plus I had to handle own admin work such as project status, Performance Evaluation. My manager was very tough. I didn’t know how tough she was. She is exceptionally intelligent. My team leader in Arizona told me that she went to the bathroom to cry many days. Six months after I left this group, my former associate called and said that most of the people left the group. Very high turn over rate. I came here to re-engineer their Profitability systems. (1) Streamline and standardization of information and technology environment to ensure cost-effective use of resources. (2) Improve the quality and delivery of application services to increase the overall productivity and effectiveness of end-user (line-of-business). I had to rewrite existing programs. It yielded to defective-free, dynamic, cost-effective, able to eliminate one manpower. I built Customer Profitability Systems using NOMAD database language and Rexx scripting on IBM/VM mainframe. This was my baby. I extracted financials and demographic data from data warehouse and other sources for management reporting. It is different from Cash-Based Financial Reporting. I massage data to produce information that is useful for future forecasting, planning, and determining financial position. The financials are Deposits, Loans, Investments, Trade Finance, Leasing, Fee-based products etc. and demographic data are CRM(Customer Relationship Management [tied to Dun & Bradstreet]), Risk Rating, FTP(Funds Transfer Pricing), NAICS(North America Industry Classification System), Account Officers(GCIB(Global Corporate and Investment banking) and Commercial banking customers tied to many account officers such as relationship, treasury, sales, credit officers), Product Hierarchy (similar to General ledger), Bank Organization Hierarchy tables. Also, the year 2001-2002, I worked two groups (my group to run/maintain my system and integration group for data mapping, variance/recon reports on legacy BofA data vs. new system). The year 2002 my group was dismantled due to new profitability system that consolidated several profitability systems existed prior to the merger with NationsBank. Luckily my employment was extended 2 more years because Commercial banking and GCIB (Global Corporate and Investment banking) wanted my system rather than using data from the new system. So last 2 years the new system’s integration group paid my salary. My first job in BofA was Commitment utilization, ETL(Extract/Transform/Load data) from North America, EMEA, Latin America, and Asia systems. Also, I supported FX devaluation and other systems. Then I developed brand new Account Analysis management reporting systems for North America division. Of cause, there was a group handles account analysis statement for each customer. However, we needed internal management reports for LOB(Line of Business), and feed data to other groups within BofA. What is Account Analysis? A banking service for business customers that provides a finely detailed statement of all activity related to the account. An earnings credit is typically offered to offset the monthly fees on the account. My system reached its maturity, so I moved to Commercial Banking group within BofA because they were looking for a person who can re-engineer their Profitability systems. This was my first professional job. I was COBOL programmer. My responsibility was to maintain/keep track of system of Branch audit finding and improvements, and annual Suspense Accounts reports to Arthur Andersen. The bank sent me for NOMAD training at UC Berkeley extension course. The instructor was from BofA -That’s why I got a job at BofA later-. I loved working for Crocker Bank because they cultivated a reputation for customer service and convenience. They were very good to employees too. It was acquired by Wells Fargo Bank. Trivia facts – Did you know? On April 21, 1975, Emily Harris, along with other members of the Symbionese Liberation Army (SLA) robbed the Carmichael, California, branch of the Crocker Bank of $15,000. She killed one customer. Do you know what SLA is? SLA is a left-wing American terrorist group founded in 1973. It’s famous for the kidnapping of Patty Hearst. She was a wealthy young heiress with no political affiliations when she was kidnapped in 1974. The opening sniper scenes were shot from atop San Francisco’s Bank of America Building located at 555 California Street. The sniper’s target is a girl swimming in the pool on the roof of the then Holiday Inn Chinatown. It was an armed confrontation between two heavily armed and armored bank robbers and officers of the LAPD in the North Hollywood district of Los Angeles. Both robbers were killed, 11 police officers and 7 civilians were injured, and numerous vehicles and other property were damaged or destroyed by the nearly 2,000 rounds of ammunition fired by the robbers and the police. What was the original name of the Bank of America? Bank of Italy. The Bank of America, the largest bank in the country, was established in 1904 by Amadeo Pietro (“A.P.”) Giannini (1870-1949) in San Francisco. During the aftermath of the 1906 San Francisco earthquake while other financial institutions were remaining closed. BofA opened and offered loans to citizens and businesses. It changed name to Bank of America in 1928. In 1958 bank issued the first bank credit card, BankAmeriCard. In 1998 merged with NationsBank Corp and moved headquarter to Charlotte, North Carolina. Bronze head of A.P. 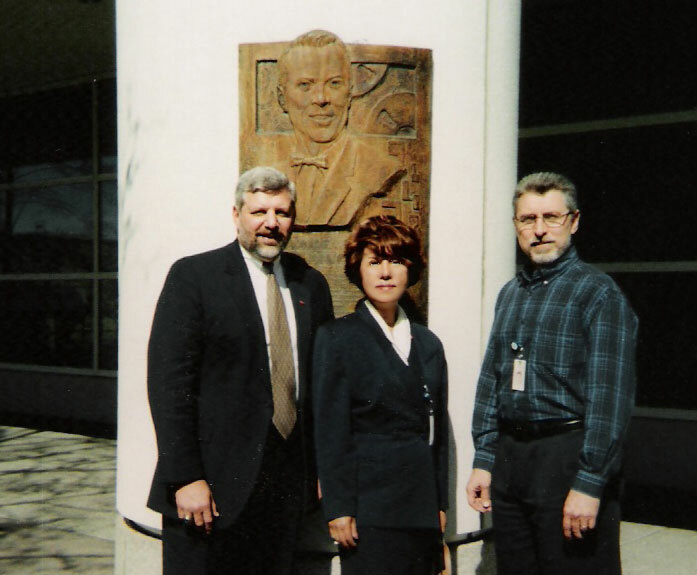 Giannini at Concord Technology Center Building “C”. Me in a business suit and business face. Hmm . . . I look intelligent & focused without make-up. Would you agree? I was fat because I’ve been doing tele-commute for a few years. It was nice to have my offices in SF & Concord & my own home at the same time. Working at home was nice. My pajama was my smart business casual. I opened the fridge door every 30 minutes just because frustrated, just because of finding a brilliant solution to the problems. My projects were always deliverable ahead of deadlines due to my dedication and determination (and intelligence -giggle). I am feeling a bit blue. Thanks John, your comment brightened up my mood. Do you ever consider working part-time? Volunteering? Keeping busy can give someone a sense of purpose, fulfillment and interaction with other people. Thank you. Yes, I have thought about volunteering. Absolutely you are right; keeping busy is best medicine for loneliness, and/or depression. I will continue to find thing to do in SF and Bay Area that I can experience the best of art and culture. I might take ballroom dance lessons and go dance-themed cruises. Only my hesitation is some of activities require (or would be nice to have) a partner. Dale, thank you for writing.